Classic 1979 officially reissued for your listening pleasure has just arrived in our lovely shop. 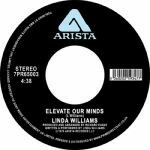 ‘Elevate Our Minds’ became a huge rare groove record in the mid to late ‘80s. It is supremely arranged, blending a bossa nova beat and trumpet thrills with Linda’s distinctly New York authenticity that comes through in the vocals. Like a trip to the blissful beaches of Rio whilst bringing a touch of the New York disco glam along for the ride. Exotic yet familiar, all in the same breath. On the flip, ‘City Living’, a straight up New York disco killer - oozing with funk, dripping in brass blasts, off beat hats and spruced up synths, it’s a primetime ode to the hustle and bustle of the city. Williams’ glorious tones, assisted by a majestic troupe of backing singers, glisten alongside the classy drumming and polished bass badness that lays behind it. A solid 7" that should become a staple on every record box out there. Sil says: Essential 7" for those who like bossa nova and/or disco. It is not cheesy, it is a classic and we already have the A side on repeat!